The first significant accumulating snow of the season is possible overnight through Friday afternoon. 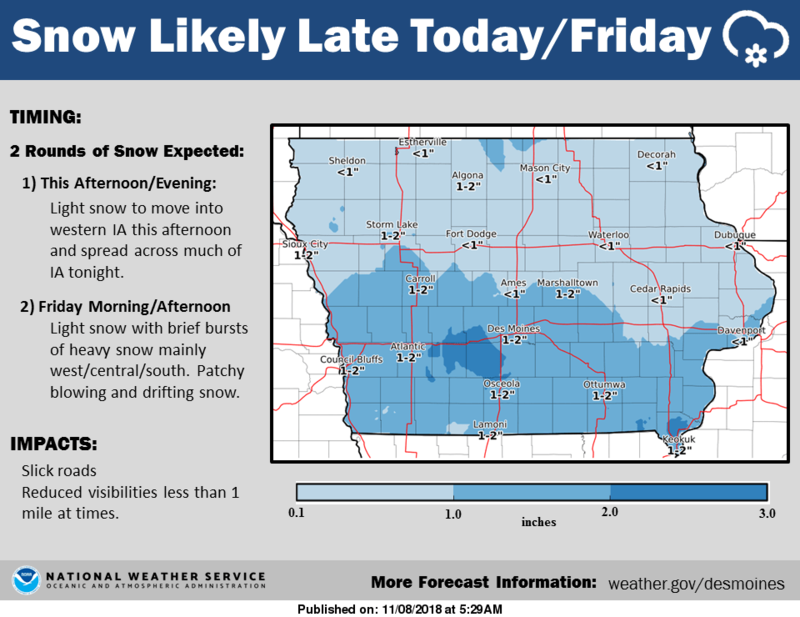 According to the National Weather Service, 1-2” of snow is possible during that time frame in most of south central Iowa. Roads may be slick, especially during the morning commute and again in the evening. Winter’s first blast of frigid air is also in the forecast overnight Friday, with lows dipping to the mid-teens and wind chills approaching zero. Daytime highs will remain 10 to 15 degrees below normal through middle of next week, and temperatures usually reach the mid-to-upper 40s in November. Stay tuned to 92.1 KRLS and visit KNIAKRLS.com for the latest winter weather information.